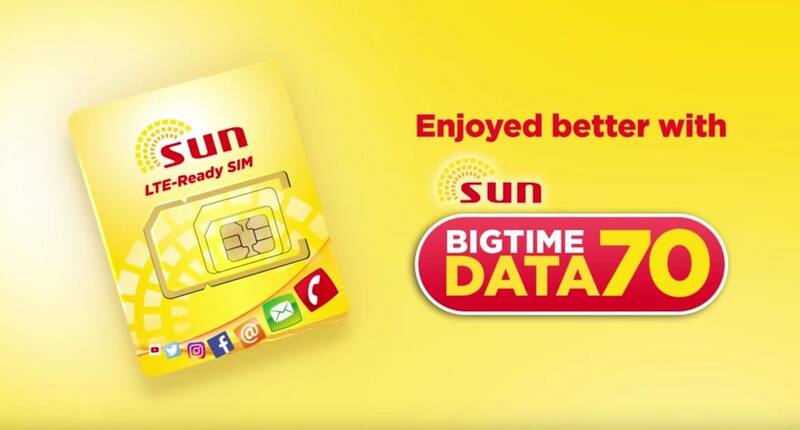 You can now always connected every day with Sun Cellular newest prepaid promo offer called Sun BigTime Data 70. After they announced the roll out of their widest LTE network and the new LTE SIM card, you can now also register for their big-time data offer. For only 70 pesos you can enjoy 1GB of internet data valid for 7 days or one week. The package also includes unlimited text to all networks and 30 minutes Sun-to-Sun calls. You can text all your friends and loves ones no matter what network they are using as long as your BDATA70 promo subscription is active. For now, you can avail or subscribe to this promo via SMS keyword. Just reload your prepaid account with 70 pesos then text the correct format provided below. Compare this to Smart 70 Pesos 1GB data + Unli SMS to all for 7 days promo called GIGA 70. Just wait for the SMS notification from Sun before you start using mobile internet to avoid being charged with standard browsing rate. Just directly dial any Sun Cellular mobile number of the person you are trying to call. No prefix number needed to connect. Tip: For better mobile internet experience, it is best to use Sun LTE SIM while registered to this BDATA70 promo. 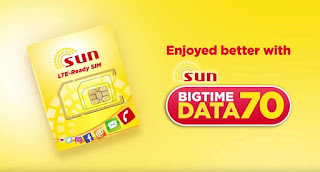 You can check out other Sun Prepaid Big Time Loads to know other offers. after registering the BDATA70 to 247 I receive this message: "You made the WAIS choice! Pwede mo nang gamitin ang iyong BDATA 70, but until now i can't access the services. I made all the possible solutions by turning ON the Sun Data button in my Celfon put my Sun LTE sim in sim1 slot went to settings and tried all the possible solutions but to no avail.